It's been a while since my last Double-Duty Beauty post! If you are unfamiliar with this series, it is dedicated to multi-purpose products, whether it's makeup, beauty tools, skincare, you name it. Today's post is focused on ClarityMD's MultiFX moisturizer. If you couldn't tell by the name, this moisturizer has multiple benefits and addresses different skin concerns, all in one product. So, you want clearer, brighter, smoother skin, all while fighting signs of aging. If you're like a lot of women, that means quite a few products taking up space in your bathroom! ClarityMD's new moisturizer addresses all those concerns in a smooth, light-weight formula that's suitable for even sensitive skin (including, yours truly). So what makes this moisturizer different than what's in your bathroom now? Clearing | Bakuchiol and Active Chamomile Complex work to clear your skin, bye bye blemishes! Moisturizing | Hydrates with ingredients such as Allantoin, which is a natural compound that conditions skin. Brightening & Anti-Aging | Exclusive Activ8 Pro-Peptide brightens, evens tone, and reduces appearance of wrinkles. How To | The convenient pump allows you to dispense just the right amount, while keeping application sanitary and convenient if you're traveling. All you need is 1-2 pumps, so start with one and see how far it takes you. The formula spreads out very smoothly and absorbs incredibly fast. I can easily move on with my routine without waiting too long and it leaves no residue on my skin. It doesn't have a strong fragrance but I do notice a smell. It's probably due to some of the ingredients, but it's nothing irritating or long-lasting. Just a note - I typically save my thicker moisturizers for at night, though this moisturizer can be used both am and pm. 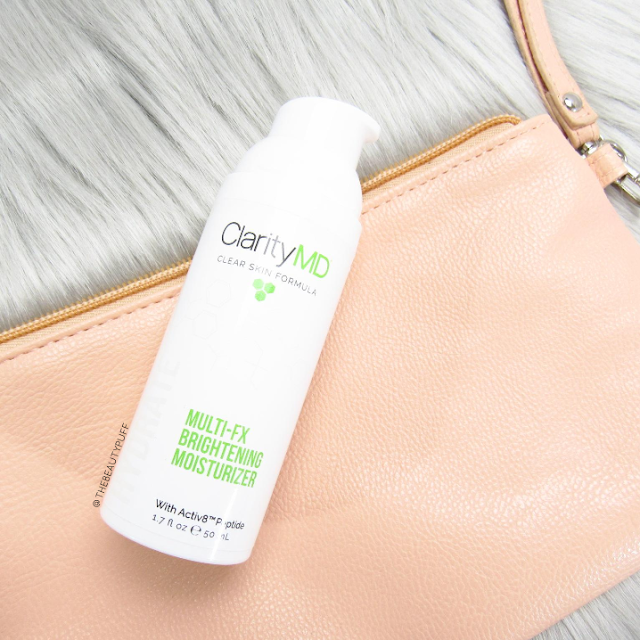 If you want to condense all those lotions and potions in your bathroom, you'll love this moisturizer by ClarityMD. My skin has been clear, smooth and in great shape whether I've worn a full face of makeup, or a very sheer, minimal look. Plus, I've saved a lot of time in the morning! You can check out the entire line of ClarityMD's products below.